Artist Ann Schroeder shares her passion for colour in this inspiring setting of ocean and sky. Ann’s hillside studio overlooks the Gulf of the St. Lawrence and the rolling dunes of West Mabou beach. Lobster boats head out to sea, watched over by the resident bald eagle pair from their lookout on the bluff. Here you can discover the magic of dyeing silk scarves, cotton fabric, and/or T-shirts with rainbow hues. You don’t need to be “artistic” or experienced in any way, just willing to play, experiment and try something new. Using safe chemical dyes, you’ll learn to mix your own colours, perhaps inspired by the blue of the ocean, the soft greens of the meadow grasses, or the colours of the sunset you saw the night before. You’ll create patterns by scrunching, folding, or clamping the fabrics. Then you’ll paint, pour, or squirt on the dyes. If you like, Ann will give you a tour of her quilt studio. 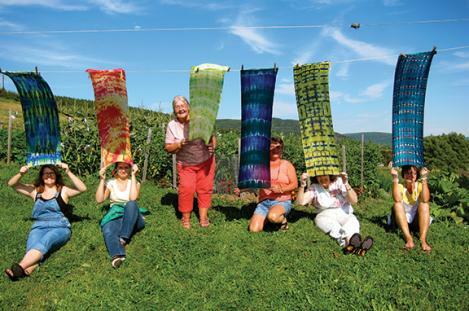 You’ll sit together at the kitchen table sharing tea and oatcakes and talking about dyeing, quilting, other artists to visit, Cape Breton music, and more. Available most Mondays through Saturdays with at least a day’s notice. A full refund minus a $25 booking fee per group will be given if cancelled at least 24 hours in advance. Children 8 and older are welcome. Men are also welcome! Please wear comfortable shoes and play clothes (not your best white linen pants). Smocks are provided.